Mon- off, traveling to Spain. 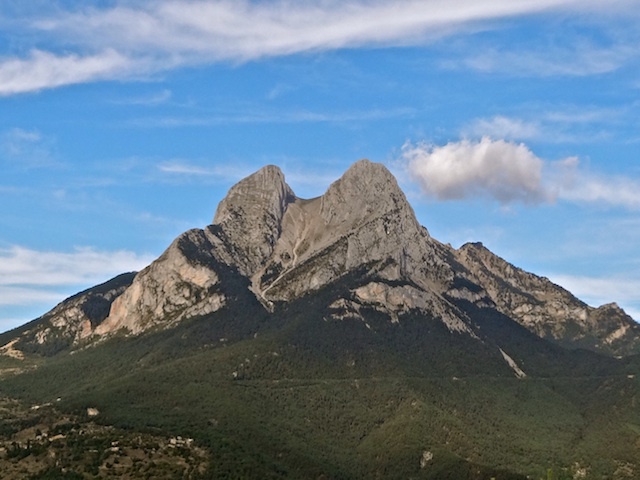 Drove with Dakota, Frosty, and Nuria to the foot of Pedra Forca near Baga (the start/finish town for Cavalls del Vent), which is a very dramatic rabbit-eared shape mountain whose base we run along during the race. Ran to the summit--including some fun, optional scrambling on the excellent limestone--before descending between the rabbit ears on some not-optimal scree. Really nice introduction to the Pyrenees. Ran from approximately km67 to km78 on the Cavalls course with Phillip Reiter, Emelie, and Frosty, which included the last two major climbs of the loop--a 600m (2000') run up a gorgeous canyon to the Refugi and then a small descent followed by a 200m (700') bop up to the final pass with incredible views of the cliff faces on the south side of the range. Gloomy, humid conditions and all in all it was a gorgeous morning out. The first climb felt quite gradual, but the final bop will definitely have some hiking in it come race day. Really seems like it will be a mint course, judging from this small taste. Ran up to the monastery on the mountains above Berga from the house and back down. Really nice mountains behind town with lots of trails, wish I could explore more. Drove up to the monastery with Anna and Dakota and went for a short, flattish out-and-back. Cool, gloomy day. Would be good weather for tomorrow, but it's supposed to rain all day, which is fine, too. 2nd place, 7min behind Kilian. Both of us were under Miguel Heras' previous course record. Really cool to have Dakota round out the podium. Pretty crazy bad weather conditions...only 183 of the 900 starters finished, many succumbing to hypothermia. Sun-PM: off. Wanna make sure I recover, but things feel fine except for my big toe joints. Weird. Taper week in Spain leading up to Cavalls del Vent. Not much else to say; the race went well. 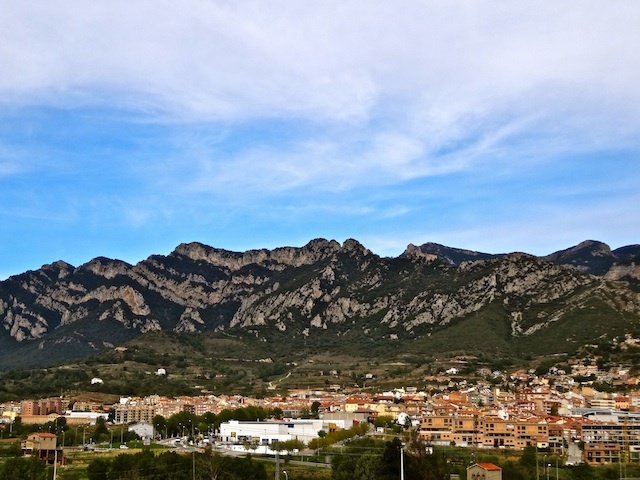 The view from our house in Berga, at the foot of the Pyrenees. 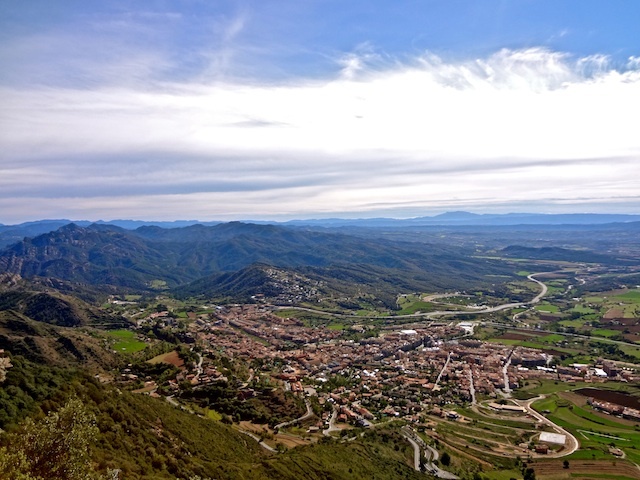 Berga, from the Queralt Monastery high on the mountain. Pedra Forca (Forked Rock?) outside of Baga. 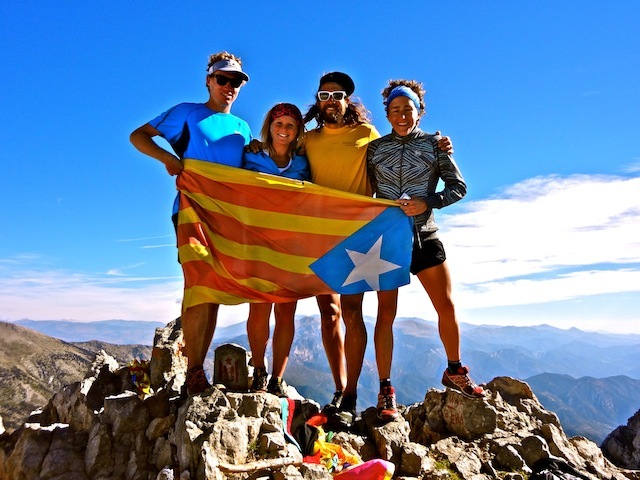 Summit of Pedra Forca with Dakota, Frosty, Nuria and a Catalonian flag. EXCELLENT report over on RT. Congrats on that race! Beautiful in many regards. Really looks like a spectacular route despite the conditions. Congratulations on a great race and hope you have time to explore more before your headed home. Good news to hear! I was cheering in Niu the L'Àguila and have some videos of you flying downhill. Great to see you all in the same race (difficult for spaniards). Great mountains hope you like them. By the way, which camera are you using? super lightweight n? Very nice writing on your raport. Good to have you back in racing. Anton, as a long time fan of your blog, I must say it has been immensely satisfying to see the evolution of your running. For what it's worth (from an outsider looking in) it seems this current way of approaching mountains is more "you" than anything thus far. Keep up the good work. You remain an inspiration to many, many people. Your race report gave me some serious adrenaline while reading. Great performance! I have been following your blog for quite some time now and I am stoked to see you ripping it up again. Keep it up! Several years ago, Leadville I think, you were carrying Gatorade part of the race and felt it was too hard on the stomach(?) during such a long run and pretty much swore it off. This last weekend at Cavalls, did Coke go down easier, or does it have so much boost the benefit outweighs the nausea? Nice finish! Wow, I can't believe the weather was so bad! it's so green there I can't imagine it being cold. And if it's not your shin it's your toe I guess! hope it went away. Yeaaah Tony! Nice work over there! Always inspired by your writing and time spent in the mountains. Good report too. Keep on. I am absolutely delighted to be a welcomed and known, Catalonia on your trip. You keep inspiring my races. Wonderful! Four of the best of the world... In my country, my home... hope to see you soon again!